Ground squirrels describe a group of short-limbed rodents that make up over 60 distinct species. These diurnal burrowing creatures are often seen busily scouring for their next meals on the floors of their living environments, whether suburban parks, grasslands, fields or even golf courses. As far as feeding preferences go, ground squirrels are heavily but not entirely herbivorous. Ground squirrels indeed consume predominantly herbivorous diets sans much animal matter. A lot of their diet actually shifts depending on the time of year. The majority of ground squirrels go into hibernation each winter, and when they finally get out from it, they usually eat things like herbs and grasses. When ground squirrels' favorite spring and summer plants go dry, they turn to alternate sources of nourishment, whether nuts, grains or seeds. Ground squirrels are enthusiastic consumers of fruit and seeds alike, but they are highly resourceful creatures, too. When those delicacies aren't so easily available, they generally make do with other food, including foliage and flowers. They sometimes even eat "meat" if necessary, specifically insects. Certain varieties of ground squirrels enthusiastically feed on grasshoppers, namely thirteen-lined ground squirrels (Ictidomys tridecemlineatus). Other things that ground squirrels occasionally eat depending on their species are fungi, buds, spiders and beetles. Some of them even sometimes feed on tiny rodents, such as mice. Since ground squirrels on the whole enter into hibernation annually, they generally utilize fat reserves to get through the wintertime. Rock squirrels (Otospermophilus variegatus) differ from their fellow hibernating ground squirrels in this respect, however. These sizable ground squirrels wake up from time to time during hibernation in order to munch on some of the food findings they stashed away beforehand -- specifically acorns and seeds. 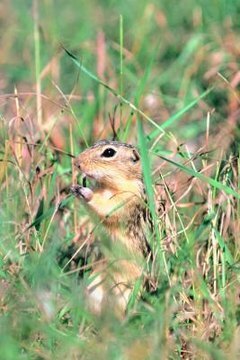 Burrows are an integral element of ground squirrels' lifestyles. They retreat to their burrows for many different things, including hiding out from predators, raising their offspring, stocking up on food and relaxing. Their haunting grounds aren't usually too big, with radii of roughly 75 yards. When they search for food, they generally remain right by their cozy burrows. Squirrels typically lead independent lives away from others. They're not particularly turf-focused, however, and because of that it isn't at all rare to spot clusters of these rodents near each other, especially when sustenance abounds. How Does the Grey Fox Get Its Food?